Look, up in the sky. It’s a bird. It’s a plane. 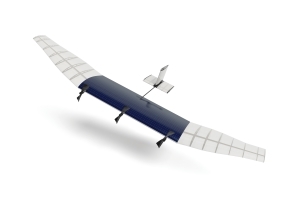 It’s a drone from Facebook? The social network Thursday announced the formation of the Connectivity Lab, which is made up of experts who previously worked with U.K.-based Ascenta, NASA’s Jet Propulsion Laboratory and Ames Research Center, and the National Optical Astronomy Observatory. The Connectivity Lab will be tasked with using high-altitude long-endurance planes, satellites, and lasers to help further the mission of Internet.org — the global partnership formed by Facebook, Ericsson, MediaTek, Nokia, Opera, Qualcomm, and Samsung last August— of providing Internet access to parts of the world that are not connected. In our effort to connect the whole world with Internet.org, we’ve been working on ways to beam Internet to people from the sky. Today, we’re sharing some details of the work Facebook’s Connectivity Lab is doing to build drones, satellites, and lasers to deliver the internet to everyone. We’re going to continue building these partnerships, but connecting the whole world will require inventing new technology, too. That’s what our Connectivity Lab focuses on, and there’s a lot more exciting work to do here. Our team has many of the world’s leading experts in aerospace and communications technology, including from NASA’s Jet Propulsion Lab and Ames Research Center. Today we are also bringing on key members of the team from Ascenta, a small U.K.-based company whose founders created early versions of Zephyr, which became the world’s longest flying solar-powered unmanned aircraft. They will join our team working on connectivity aircraft. Begun by the same engineering talent behind Facebook’s infrastructure team and the Open Compute Project, the Connectivity Lab team has been working on developing new platforms for connectivity on the ground, in the air, and in orbit. To make these platforms a reality, we’ve recently added some of the world’s top experts on aerospace technology, including the team from Ascenta, a U.K.-based company with a deep expertise in designing and building high-altitude long-endurance (HALE) aircraft. The five-member Ascenta team has combined more than 100 years of experience in the aerospace industry, including leadership positions with QinetiQ, Boeing, Honeywell, and Harris. They have worked on noteworthy projects like the Breitling Orbiter and early versions of Zephyr, which became the world’s longest-flying solar-powered unmanned aircraft. Other recent additions to the team have come from organizations including NASA’s Jet Propulsion Laboratory, NASA’s Ames Research Center, and the National Optical Astronomy Observatory. The team’s approach is based on the principle that different sized communities need different solutions, and they are already working on new delivery platforms — including planes and satellites — to provide connectivity for communities with different population densities. For suburban areas in limited geographical regions, we’ve been working on solar-powered high altitude, long-endurance aircraft that can stay aloft for months, be quickly deployed, and deliver reliable Internet connections. For lower-density areas, low-Earth orbit and geosynchronous satellites can beam Internet access to the ground. Readers: Are you intrigued by the projects Facebook’s Connectivity Lab is undertaking?